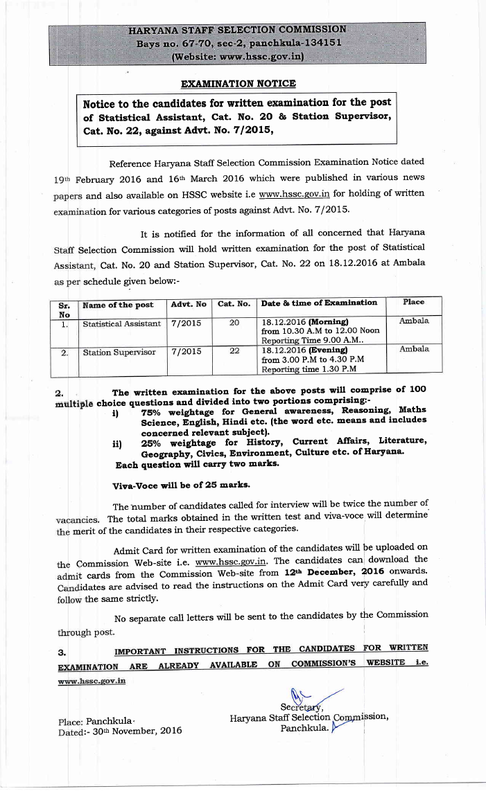 Haryana Staff Selection Commission (HSSC) will organize a written examination for Stat. 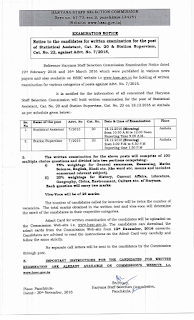 Assistant & Station Supervisor posts which are advertised under advt 7/2015 cat. 21 & 22. The test is to be held as a part of this advt 7/2015 selection process. Now the date of examination had been declared. Here you can download HSSC Statistical Assistant & Station Supervisor Exam Admit card from below given link. Haryana SSC is going to conduct written exam for Statistical Assistant & Station Supervisor posts of advertisement no. 7/2015 on 18 December 2016. For that, admit card are to be made available from 12 December 2016. Eligible candidates have to download HSSC Admit card for Statistical Assistant & Station Supervisor exam from the official website hssc.gov.in via the direct link given below. Statistical Assistant advt 7/2015 Category no. 20 - 18.12.2016 from 10:30 am to 12:00 pm reporting time 09:00 am. Station Supervisor advt 7/2015 Category no. 21 - 18.12.2016 from 03:00 pm to 4:30 pm reporting time 01:30 pm. The written examination will comprise of 100 questions of MCQ type. There will be two portions. 1. 75% weightage is for General Awareness, Reasoning, Mathematics, Science, English, Hindi etc. (the word etc. means and includes concerned relevant subJect. Geography, civics, Environment, culture etc. of Haryana. The number of candidates called for interwiew will be twice the number of vacancies. The total marks obtained in the written test and viva-voce will determine the merit of the candidates in their respective categories. In order to download the admit card for HSSC Statistical Assistant & Station Supervisor exam, you have to login at above link website which will be taking you to http://adv3.hryssc.in/. You have to enter your login id and password and click on sign in. Their HSSC Statistical Assistant & Station Supervisor Admit card 2016 will be shown.